A 501c3 based in Los Angeles, DDR is changing the face of animal rescue here in California and beyond. Downtown Dog Rescue's executive director and founder Lori Weise is a gentle, zen-infused force to be reckoned with. Since it began in 1996, DDR has made (and continues to make) an indelible impact on the socioeconomic ripple effect of homeless dogs and low-income families. In just the last year alone, Lori Weise has been nominated as a CNN hero, Vanity Fair highlighted DDR as one of their "Charities We Love," and the Bark featured Lori in a piece titled "People Who Matter." Beginning in Skid Row, DDR moved their services to South LA, then Compton, then Watts, and now the entirety of South East Los Angeles (part of both the city and the county). By providing spay/neuter services, veterinary care, food, and covering municipal fees for pet owners, the resulting DDR numbers are staggering. For example, in 2011, the Compton Park clinic sterilized close to 800 dogs and the number of "owner surrender" euthanized pitbulls in that same year dropped an astounding 30 percent. Truthfully, if you're a family struggling to feed yourselves and your kids, spaying your dog isn't likely to be on your list of feasible expenses. But, as these numbers reveal, spaying/neutering is a vital part of animal rescue and by making this simple fix (pun intended) accessible and free, DDR is helping to dramatically reduce LA's overwhelming shelter populations. We don't actually know when or if Lori ever sleeps, because when she's not traveling the country educating others about the value of intervention programs, writing books like "First Home, Forever Home" (a wonderful holiday gift we'd highly recommend for the animal lover in your life), or running her own dog kennels ("Second Chance Kennels"), she manages over 80 employees at Modernica. Yeah, she's kind of a super woman. We're psyched to get this SHAPERS Q+A with such a spectacular, exceptional human. ENJOY! Your ingenious approach to keeping dogs in their "first home forever home" is making an incredible, positive impact on the number of euthanized pets here in Los Angeles. Could you tell us a little bit about your South Los Angeles Intervention program and how it's affected the community and the numbers of animals being relinquished to the shelter? 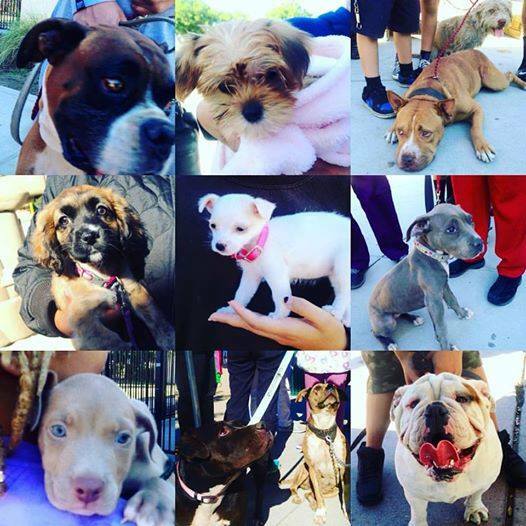 The program started in April of 2013 the day the new South LA shelter opened. Thanks to Found Animals Foundation, who funds the majority of our program, we are able to have a full time counselor and we just hired a part-time counselor. Amanda Casarez, our full time counselor, is wonderful. I have learned so much from her. While the original goal on paper was to keep pets out of the shelter thus reducing shelter euthanasia at the South LA shelter, it has evolved into a lot more. When I started working with dog owners who were homeless, the work was shelter intervention for the most part. Because I had no where for their dogs to go even if they wanted me to take them, I did everything in my power to keep them together in the most humane way possible. This was all I knew and for the most part worked well. The same skills I learned, I've applied to the shelter intervention program. It was no surprise to me that the community needs a lot of help, stemming mostly from poverty. I've always believed that we don't have a "pet problem" we have a poverty problem. When we set up ways for people in a crisis to be successful, counseling them with respect, in a non judgmental way, we are offering solutions and options Ultimately the decision is the pet owner, sometimes limited in their options because of bad decisions or decisions made for them due to living in such an extreme state of poverty. For example if one has finally found a place to live after months even years of being homeless only to find out the housing will not accept their pet, that person is at a real crossroad in their life. We can all think or say I would never give up my pet but most of us have never been in these dire positions. Positions where it's a choice between keeping the human family members together so that child protective services doesn't take the children away or giving up the pet to the shelter, it's these types of cases we see, more specifically our counselors deal with on a daily basis. Most of our families are spending more than 60-75% and more on housing for those who have housing. When you do the math, there's not much left over for anything else. The most exciting part of the shelter intervention program is the concept of moving the services away from the shelter, so that families won't come to the shelter in the eleventh hour looking for resources. My goal and the goal of the organization is to raise as much money as we possibly can to fund programs that go out into the community such as free spay/neuter, vaccinations, microchips, wellness care, dog training and more, much more. Employing people from the community, like our newest counselor Jennifer, is another aspect of helping the community. The community we serve needs more job creation. We are doing our tiny part but the beautiful thing is we are doing it. When you consider our original goal was to keep 400 pets out of the South LA shelter back in 2013 and we achieved that goal in a mater of months, it's amazing. We are now over 5000 cases and counting. When we started, our program was the only one in LA, now there is the North Central Shelter and East Valley shelter intervention programs. The ASPCA modeled a program after our program called Safety Net that operates out of the Downey and Baldwin Park shelters. I believe helping people keep pets out of the shelter is the next most important phase in animal welfare but it's always just been all that I know how to do. Plus I love the work and can't wait to see what's going to happen tomorrow. We've heard people say (too many times, frankly), that if "people can't afford a pet they shouldn't have one" or that "homeless people aren't good pet parents." Your program confidently disproves these snap judgment theories. Can you delve into this a bit deeper? The assumption is on a false belief, that the pet owner has always been poor and or will never transition out of poverty. In some cases, if a pet is healthy, it's actually not that expensive to provide care for a pet. I also think that people who love pets love pets, period. While it might make sense to not adopt or acquire a pet until one is out of debt. However, rules are made to be broken and some of the pet owners we meet did not plan on getting that cat or dog. Like anyone who cares, a loved one died and didn't have a will or a plan for the pet, so they decided to keep the pet. A neighbor moved out in the "middle of the night" type move and that's how the pet came into their life. Rescue, often time, we don't hear the word rescue but that's what's going on. Dogs wandering on the street for months, families putting out food and water until one day the shy little dog is their new family member. The question we should be hearing more is why aren't there more resources for people living in poverty with pets. Not why do they have them. I was that person when I found my cat I had all through my 20's into my late 30's I was broke, working, barely paying my bills and no I didn't need a cat. She was pregnant and I couldn't just leave her. The San Gabriel Humane Society spayed her for I think $20 and it was years before she had any medical issues and when she did, I figured it out. It wasn't until her last years of life, at 16 years old did I own a home and could afford a pet. As the general manager for Modernica, Inc for the last two decades, what can you share with us regarding timeless design, its staying power, and its ability to dramatically and wonderfully change a space? It's been a dream job and never really seemed like a job to run Modernica. I started off finding amazing modern design in the trash, at the Salvation Army auction and other thrift stores and countless yard sales. I've always loved architectural inspired modern design. It has a staying power because it's functional and if vintage is usually amazingly built and beautiful. There are certain pieces I never get tired of looking at I have a Nakashima lounge chair that is so beautiful. When you acquire an amazing piece, you will always love it and it will bring you so much happiness, a few well chosen pieces still make me smile when I look at them. I love Finnish mid century modern design and California craft from the 1960-70 All of it inspires me daily. Dabs Myla's "dream art-house" at the Modernica Factory this October. I work with amazing team of people who keep Modernica evolving all the time. Now, I'm interested in what the next generation of shoppers is interested in. Partnering with artistslike our recent collaboration with DabsMyla, seeing how many people came to the show and purchased the fiberglass chairs we produced with their designs, proves the staying power of this great design. Modernica's collaborative fiberglass chairs, imprinted with Dabs Myla's original designs. Have you always been so bonded with dogs? Please tell us why you find dogs to be such amazing creatures and souls. My mom is a major animal lover and when I was four, she got a German Shepherd from Mr Kline, my grandma's neighbor who bred GSD. He spayed her and did a yard inspection, according to my mom. We named her Heidi and she was basically my sister and best friend, the one I would tell all my problems to after school. She was the best dog and died when I was 16 years old. I'll never forget when the vet lea her to the back and I never saw her again. That moment in my life made me understand how important it is to have families be with their old ill pets all the way to the end of their life. However, I'm not one of those people that love animals more than people I like people and I'm fascinated why people do whatever they do, whether it's shopping for furniture or surrendering a dog, I'm always curious, kind of like a dog. I love how they live in the moment, through living with lots and lots of dogs, packs of dogs, I often think more like a dog now which in turn helps me in business! A couple kissing pooches at the DDR Kennels. What are some easy and free ways that compassionate, caring people can help to save animals’ lives in Los Angeles and beyond? Listen to someone who is struggling with a pet, whether they are considering surrendering the pet or they have to "get rid of the pet" because they are moving. Listening is sometimes the one thing that a person who is struggling never finds. Too often the struggle has nothing to do with the pet, it's far more complex but helping the person helps the pet, sometimes, keeps the pet out of the shelter. Help someone with a pet who is very close to you. Whether it's an elderly neighbor who is struggling to walk their dog, or a family who can't afford some type of care or can't afford to pay for pet food, pay for it, no strings attached. Go to your local shelter and even if it's a couple hours a month, see what you can do to help Use your talents to help get more pets adopted. Lori Weise and Precious, one of the thousands of dogs she's managed to save with DDR. Morning for sure. If I could, I would be happy to be in bed asleep every night by 8:30 I live with so many dogs, I'm up every day by 4:30AM and I love it. The morning is so still, it's a great time to think and plan and when I'm most receptive to creative ideas, thinking about a problem in a new, unexpected way. If you could have lunch with one famous person, living or dead, who would it be? And where would you dine? The kitchen at my last house in Altadena. I had a Richard Schultz Redwood petal dining table and Bertoia wire chairs I would sit in to work. I used that little dining table as my work table to do writing, laying out bills, it was my office, with dogs passing in and out to my huge back yard with a regulation dog park in the rear of the property. RIchard Schultz redwood petal table for Knoll.